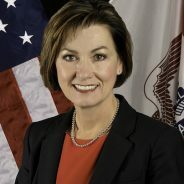 Home Posts Tagged "Kim Reynolds"
Iowa's privatized Medicaid program has been a disaster since day one. We call on Governor Reynolds to immediately end the privatization of Iowa's Medicaid program and push to guarantee quality healthcare to all Iowans, regardless of employment, income, or health status. Are you with us? Add your name here: Tell Gov. Reynolds to put our lives before corporate profits!